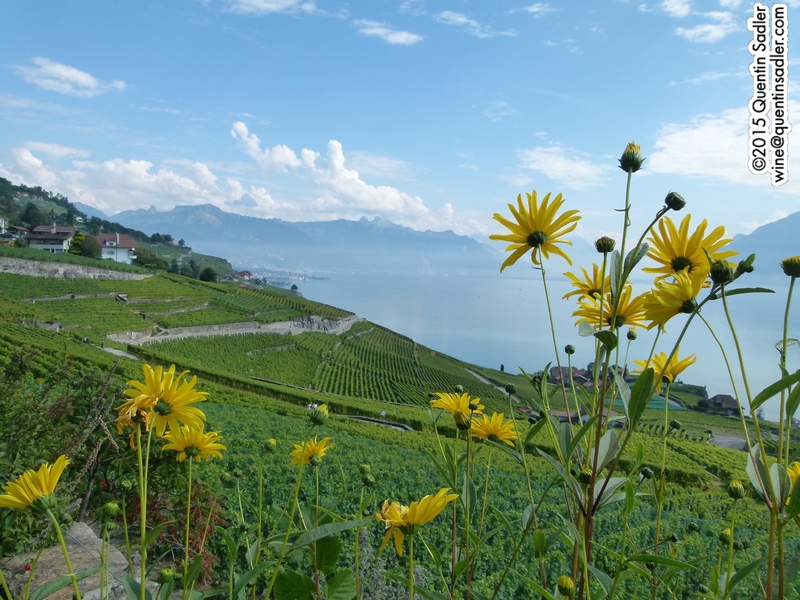 Not too long ago I told you all about my wine experiences in the French speaking parts of Switzerland. 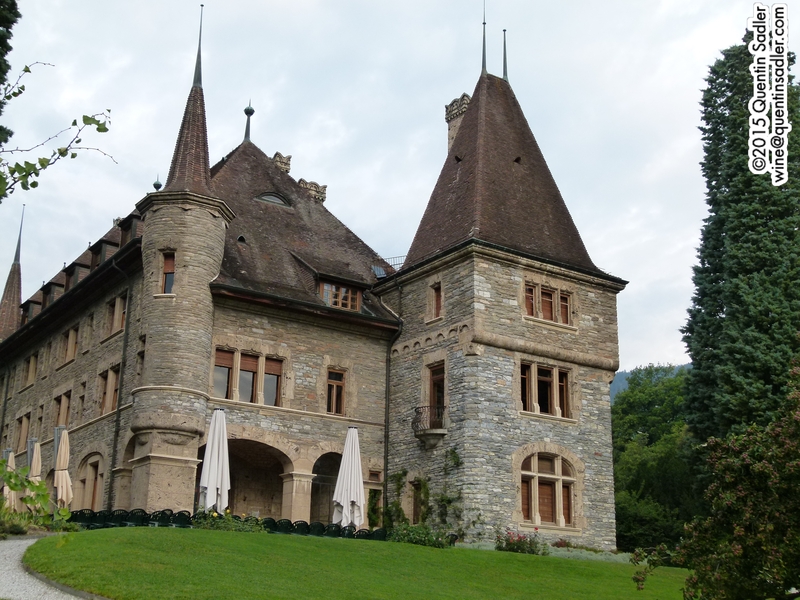 I loved touring around Lake Geneva and Valais and thought the wines were terrific and well worth seeking out if you get the chance. 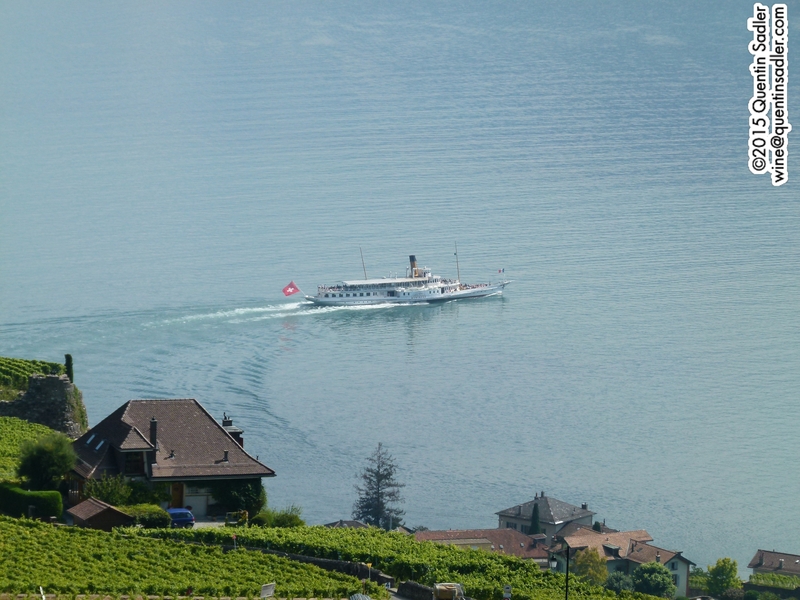 However, my Swiss experiences were not restricted to the French speaking parts of that beautiful country. 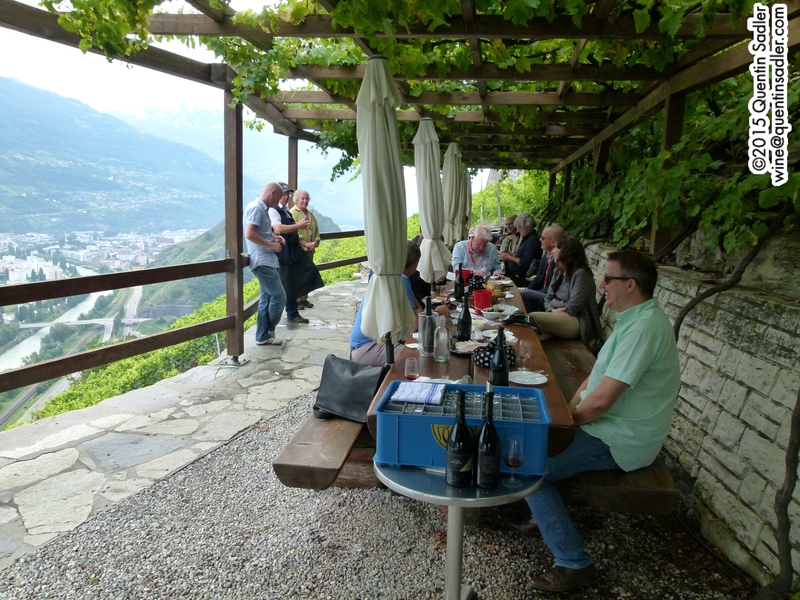 The little group of wine writers and educators that I was with then went on to Ticino, the small Italian speaking park of Switzerland – remember to click on all the links. 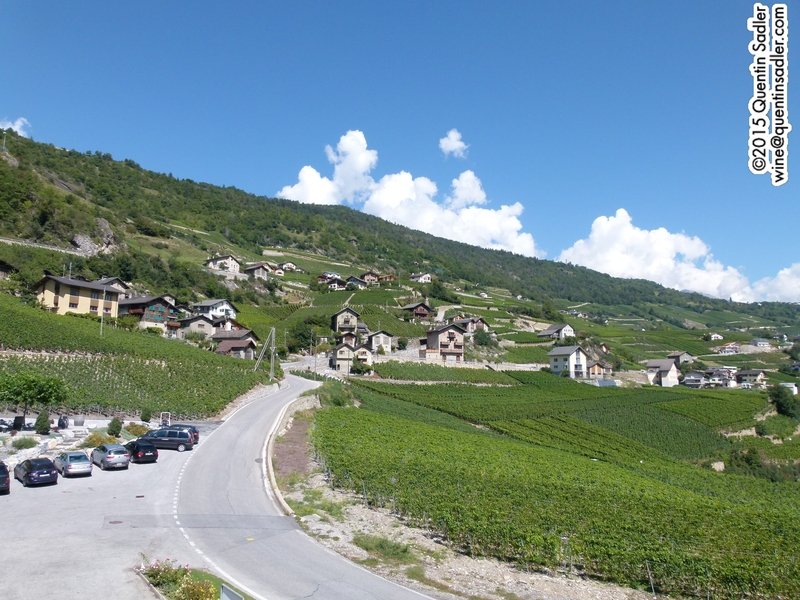 What a trip it was, four changes of train had taken our little group – with very different levels of comfort and mixed availability of seats and luggage space – from Sierre in French speaking Valais, over to Ticino. 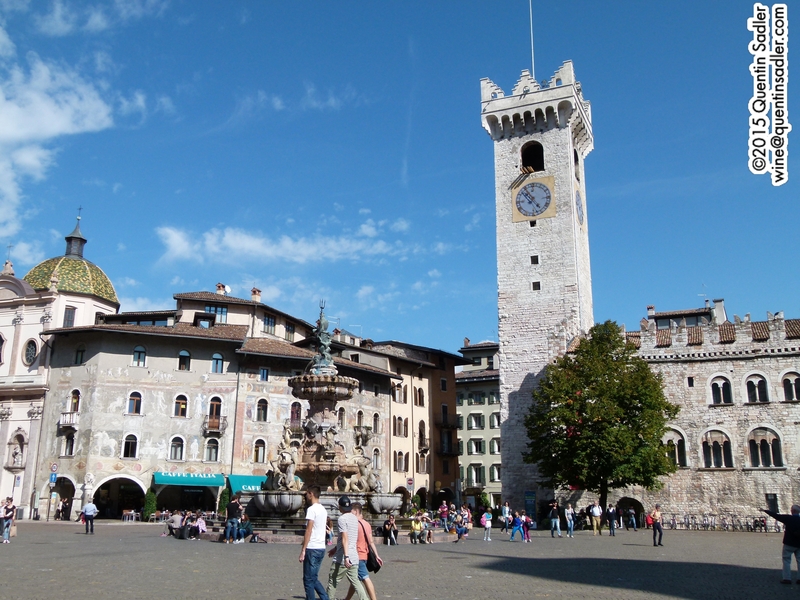 We eventually arrived in Lugano with enough time for lunch and a chance to pull ourselves together before heading off for our first visit in this very different part of the country. 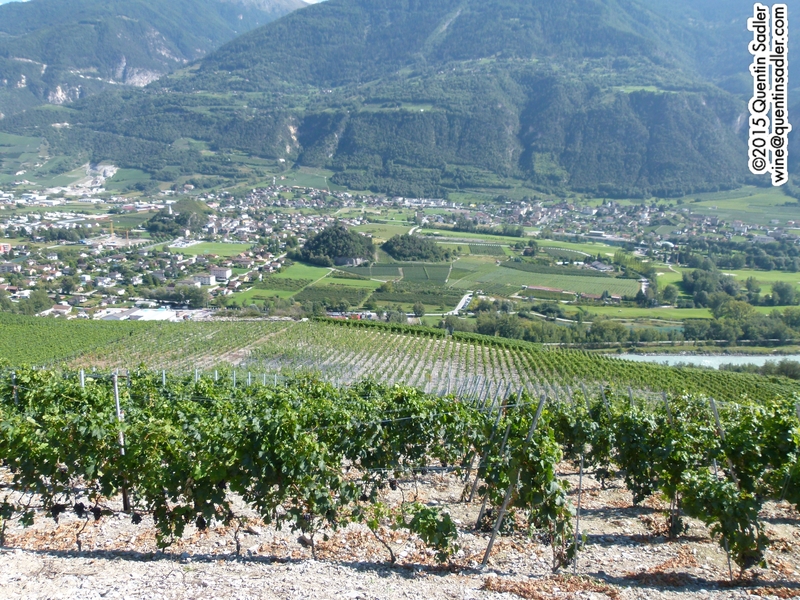 Being culturally Italian, wine has of course been made in Ticino since before Roman times, but it was the planting of Merlot from 1906 onwards that transformed the quality of the region’s wines and the grape now accounts for well over 80% of the vineyards. 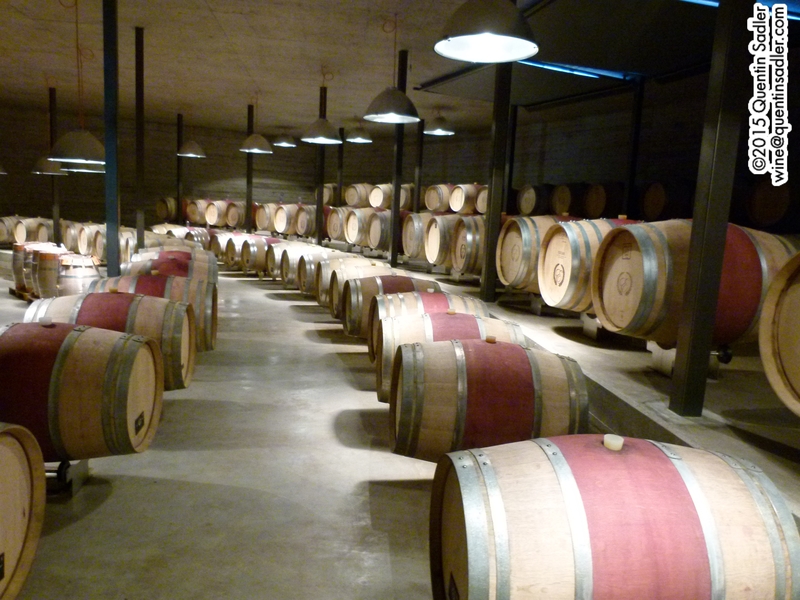 To a large degree the whole concept of quality wine here is synonymous with Merlot. 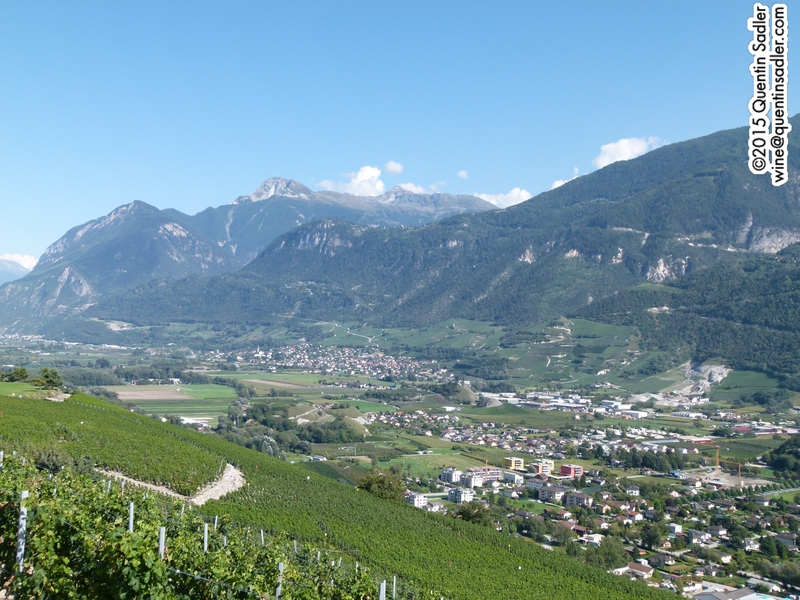 The grape was considered perfect for the region because, although Ticino is sunny with some aspects of a Mediterranean climate – palm trees thrive here – it can also be very rainy, and Merlot copes pretty well with those conditions. 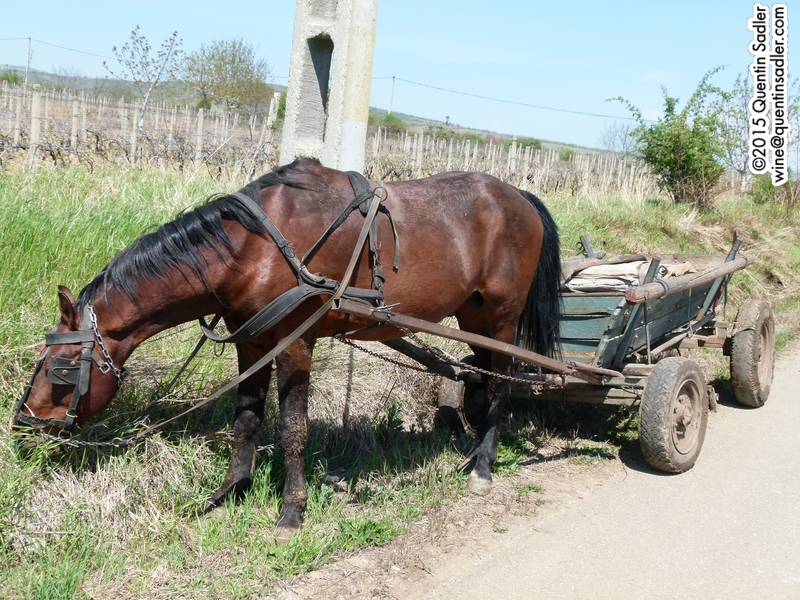 Before 1906 the region used a wide spread of grapes similar to those found in Piemonte as well as the local speciality Bondola which is enjoying something of a modest renaissance. 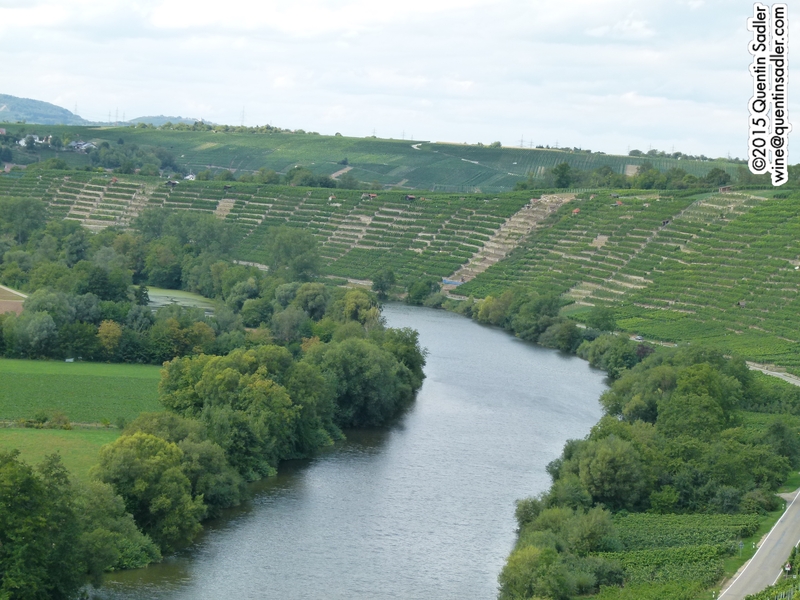 In addition to vitis vinifera, American grape varieties and hybrids are grown here – principally Isabella / Albany Surprise – for the production of grappa. 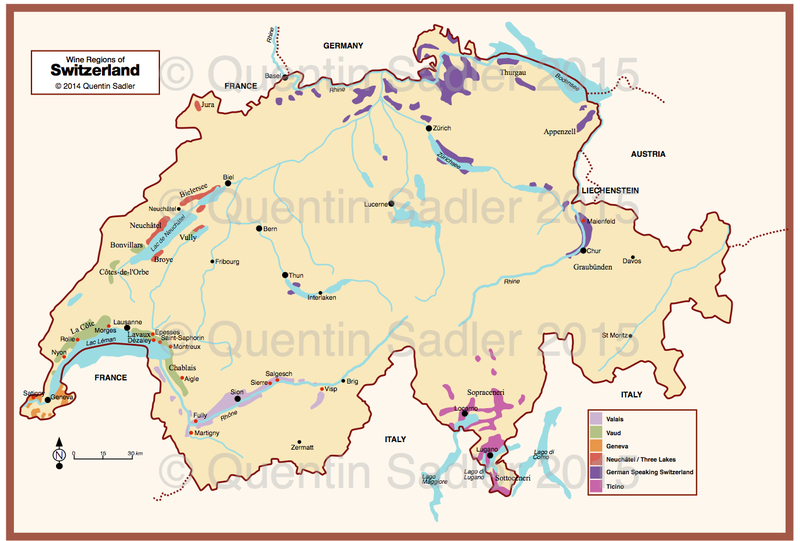 Wine map of Ticino, click for a larger view. 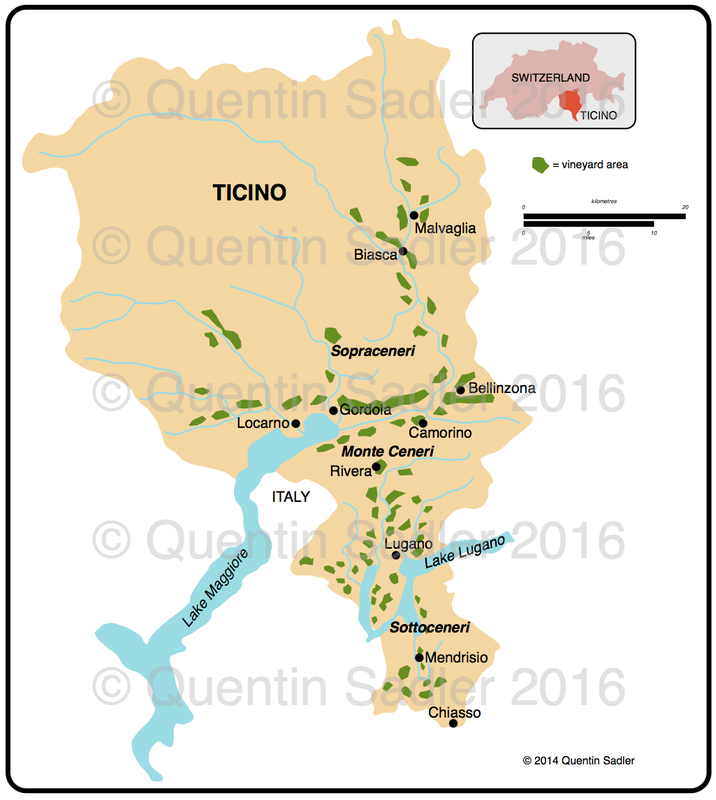 There are two sub-regions of Ticino, Sopraceneri in the north – it means above Monte Ceneri and is where Bondola can be found – and Sottoceneri, below or south of Monte Ceneri. 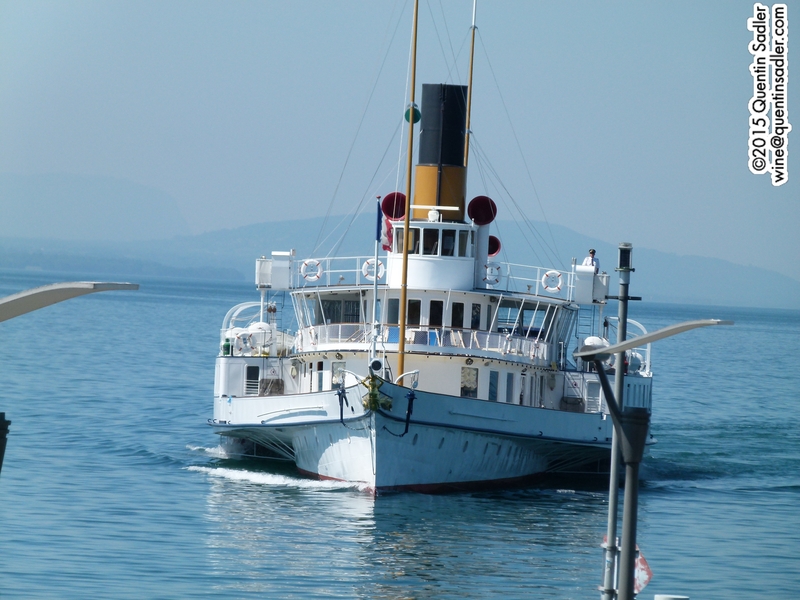 This southern part straddles Lake Lugano and spreads down to the Italian border. 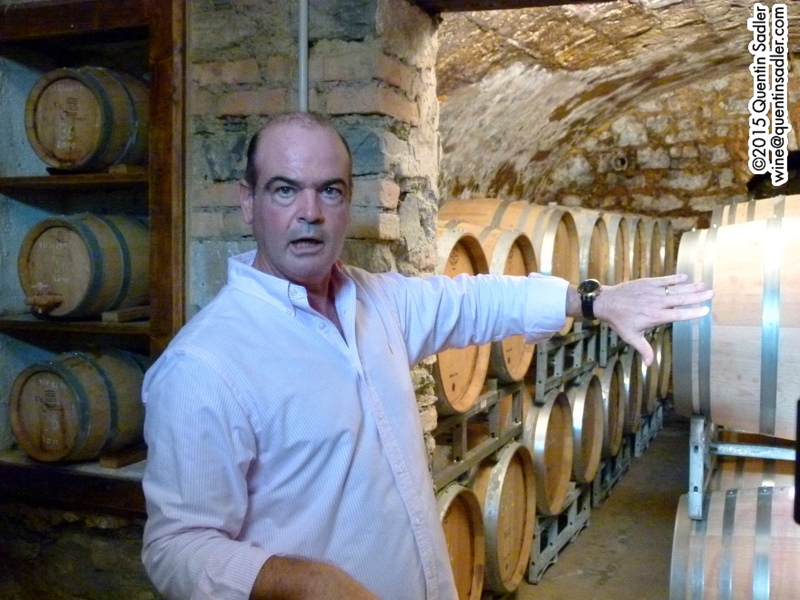 Most growers and producers in this region are very small indeed, but Gialdi Brivio, is one of the few large winemakers. However, they own no vineyards and so act as a negociant. 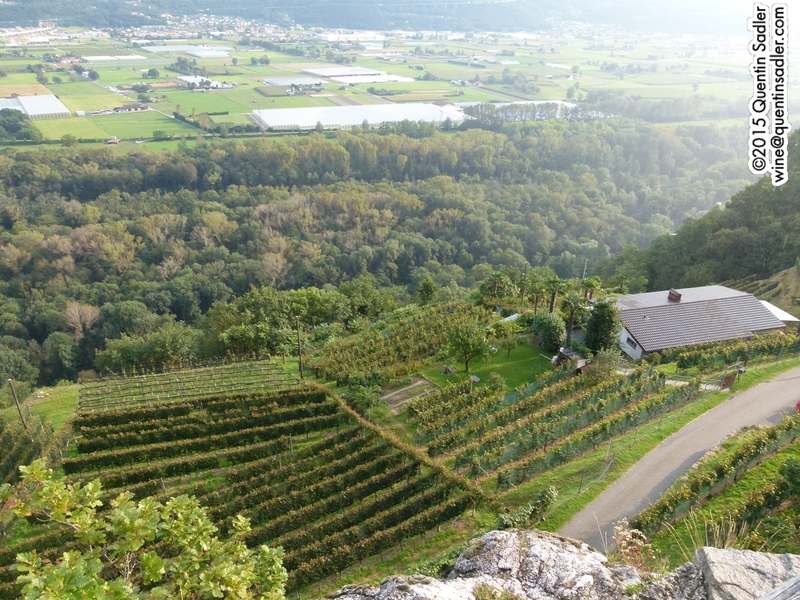 Some 400 growers bring their grapes to them and their viticultural team are also active in managing these vineyards. 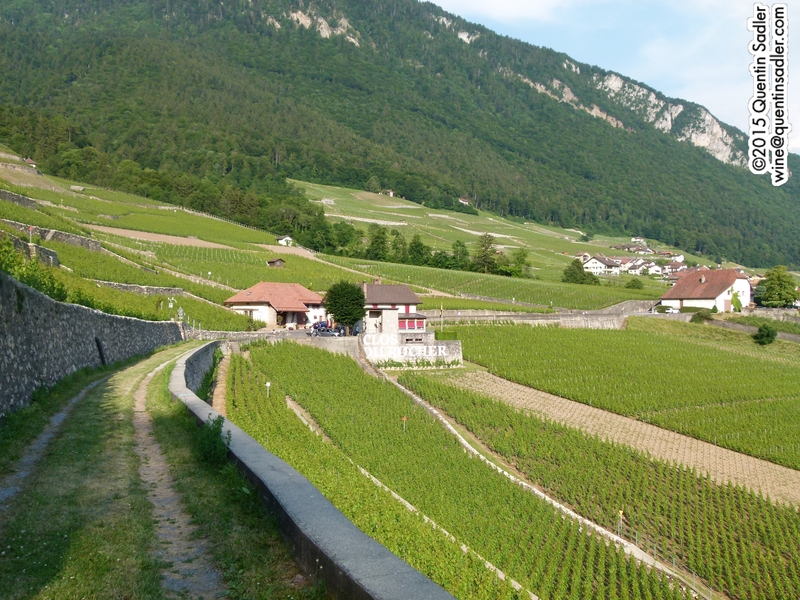 The vineyards are often steep and hard to work and so somewhat amazingly the average cost of a kilo of grapes here is CHF4.50 (roughly £3.20 / €4.20) – pretty much the same as in Champagne. 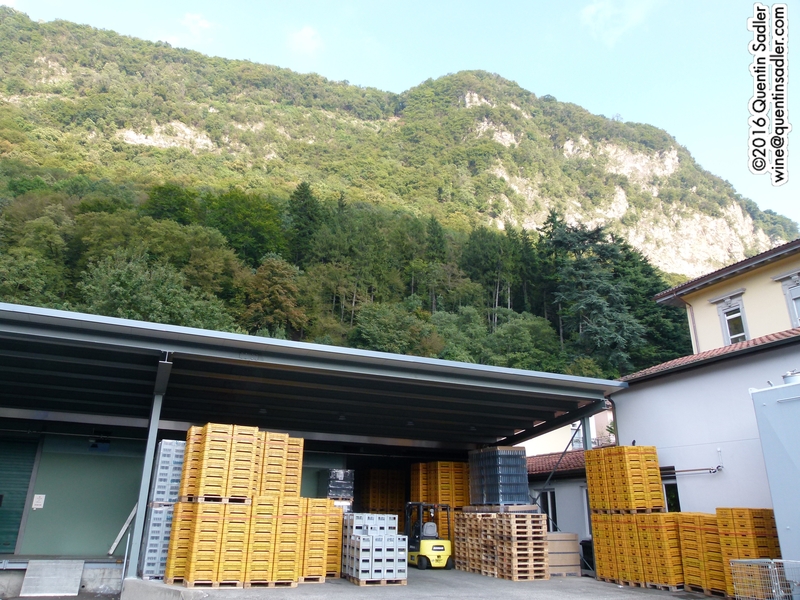 Gialdi Brivio’s warehouse and winery at the foot of Monte Generoso. 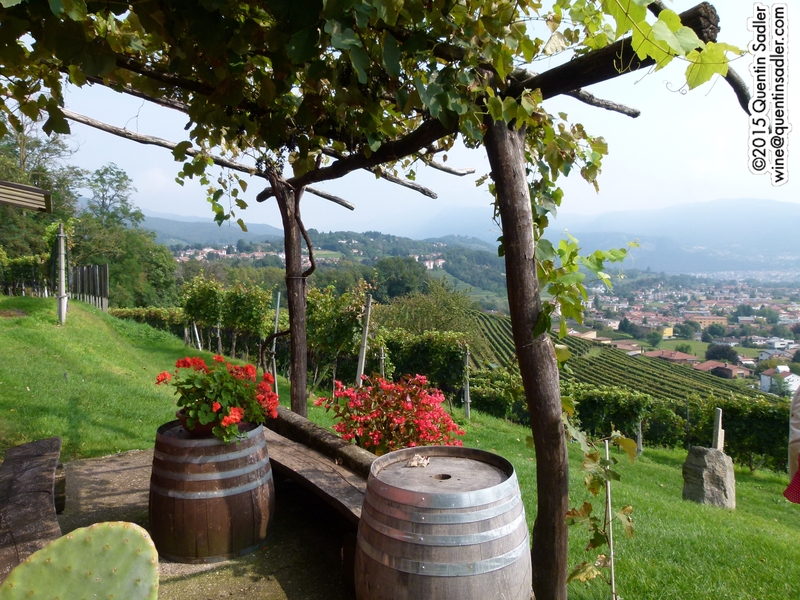 Gialdi Vini was founded in 1953 and makes wines from grapes grown in Sopraceneri, while Brivio Vini was created by Guido Brivio in the late 1980s and specialises in wines from the Sottoceneri. His family has a background in the wine and spirits industry, but his dream was always to make high quality wine. 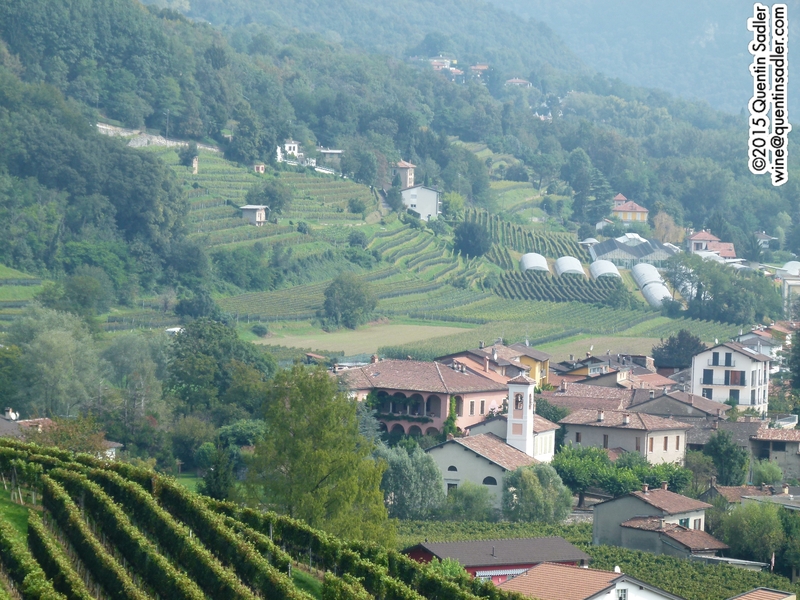 The two companies merged in 2001 and now share winery, cellaring, bottling and distribution premises in Mendrisio, which is 3 km south of Lake Lugano and 3 km north of the Italian border. 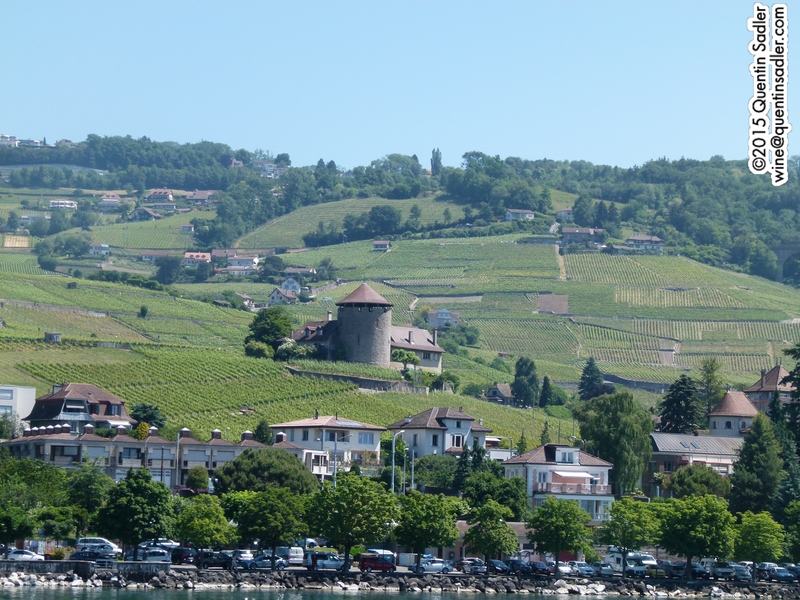 They also act as an importer and distributer for many Italian wines in Switzerland. Guido was our host for the afternoon as well as later at dinner and he was charming, welcoming, knowledgeable and justly proud of what they do and the region in which they operate. 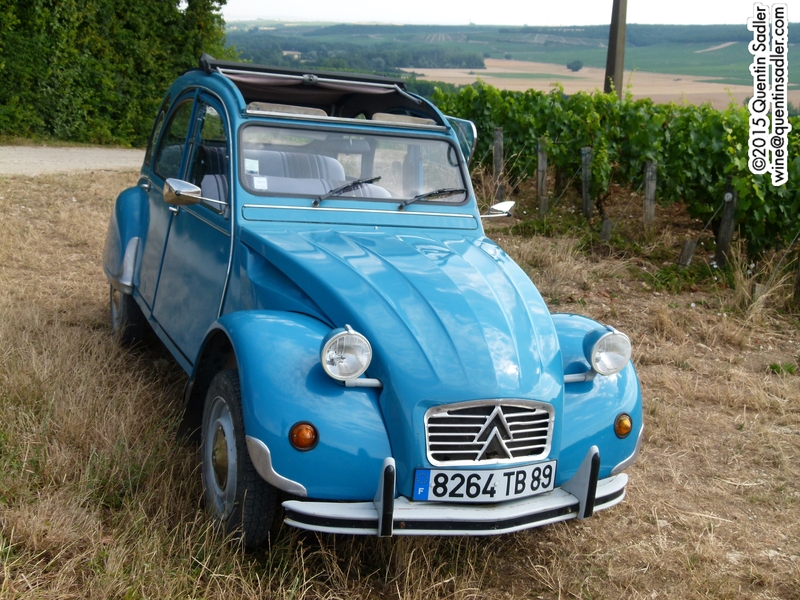 Something that I had never encountered before, was that because they make almost all their wines from Merlot, whether they are red, white or rosé, they have spare grape skins which they can add to the fermenting must to increase the colour of their reds. 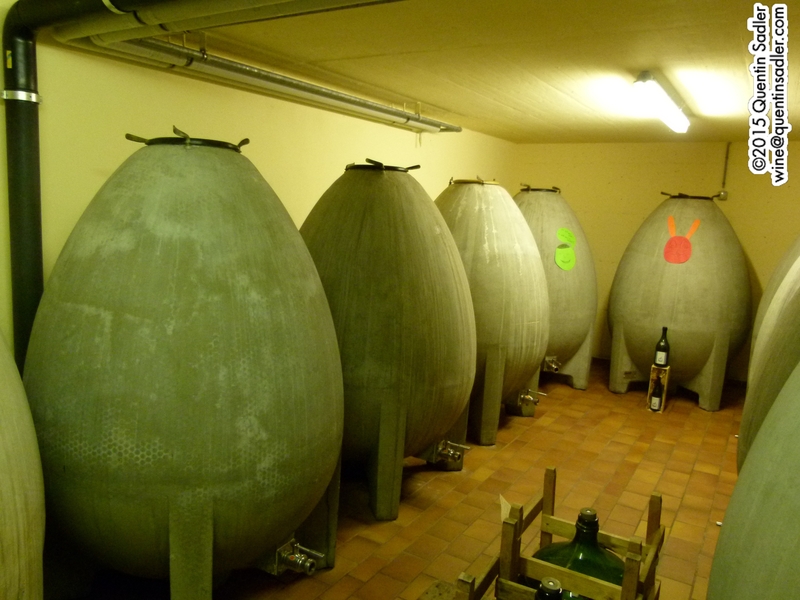 Conversely, in order to accentuate the freshness of their white wines, which are almost all made from 100% Merlot, they mostly stop them from going through malolactic fermentation and filter them through charcoal to ensure there is no residual colour. 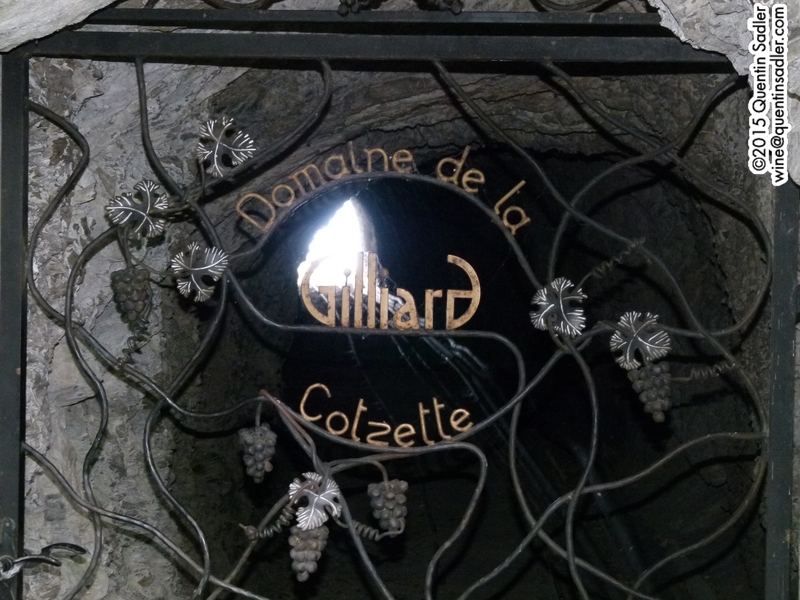 For two of their top red wines – Gialdi’s Trentasei Merlot and Brivio’s Platinum Merlot – they concentrate the sugars in the grapes by drying them using large fans for about 3 weeks in their cool, dry cellar conditions. 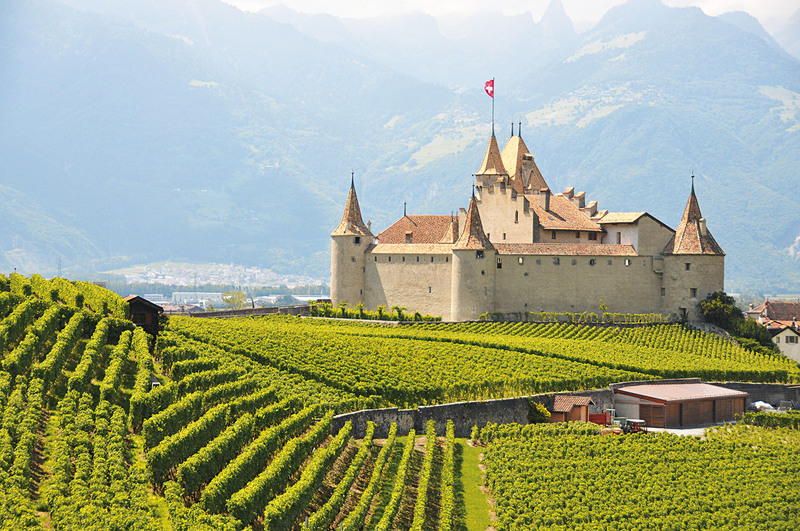 This reduces the water content of the grapes by around 50% and a proportion of these dried grapes are added to normally ripe grapes, so making the whole wine more rich and concentrated. One of the vents in the cellars. 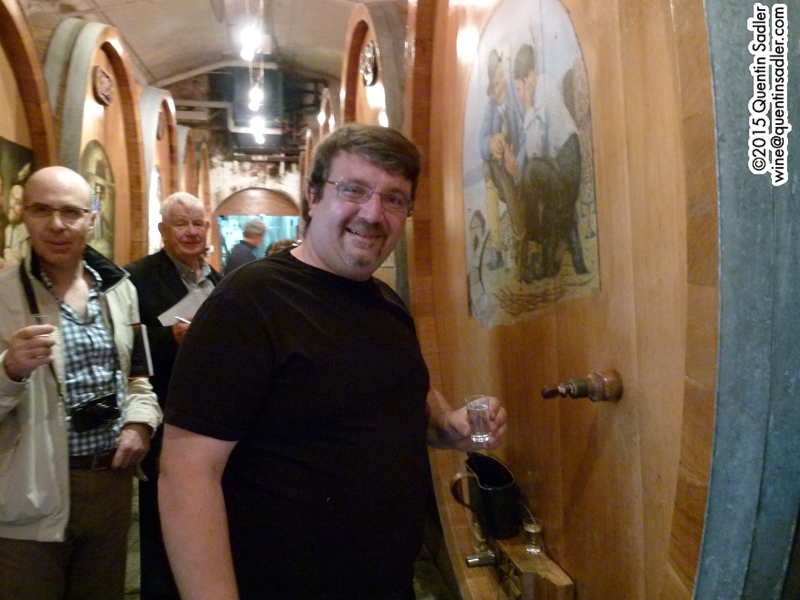 One amazing aspect of the place is the cellars and how they are cooled. 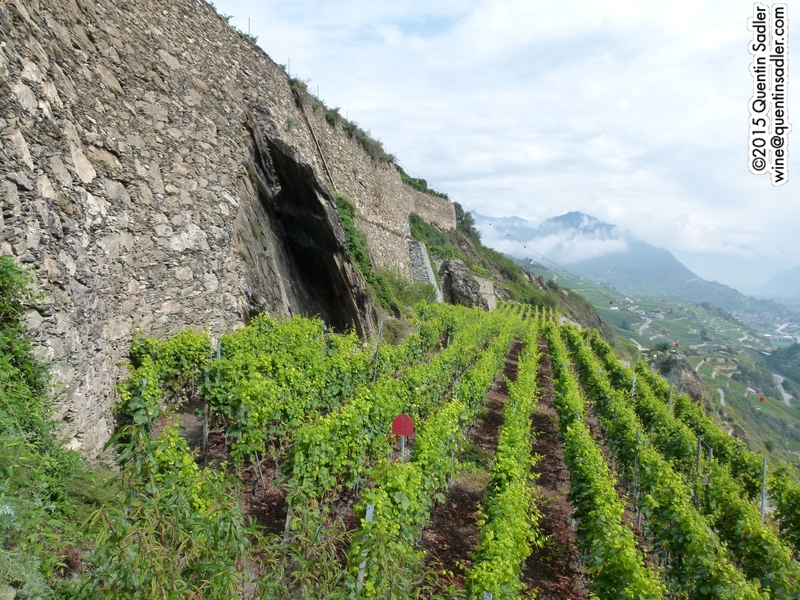 Most of their red wines are aged in a series of ten little stone cellars, called grotti, which are built into the base of Monte Generoso which is behind the winery. When it rains the water drains through the mountain into Lake Como. 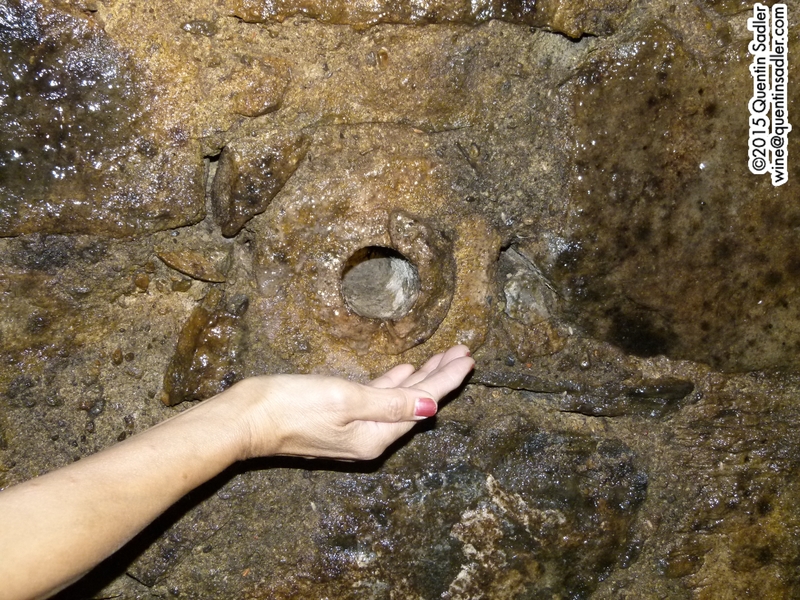 This draining water forces fresh, cool air through fissures in the rock causing a sort of natural air conditioning which keeps the cellars at a constant 11˚C. 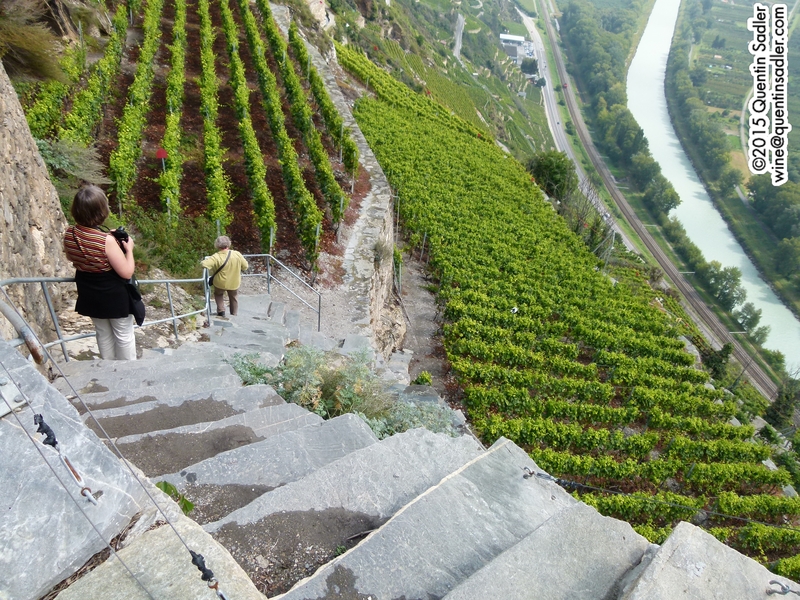 They have installed vents to channel the air into the cellars and the amount of cool air pouring through is astonishing – it truly is astounding what nature can do. According to Guido this cool temperature ensures that any sediment falls to the bottom of the casks quite quickly and this fast stabilisation means they lose less of the wine to absorption by the barrels, which is usually 2 litres per month. 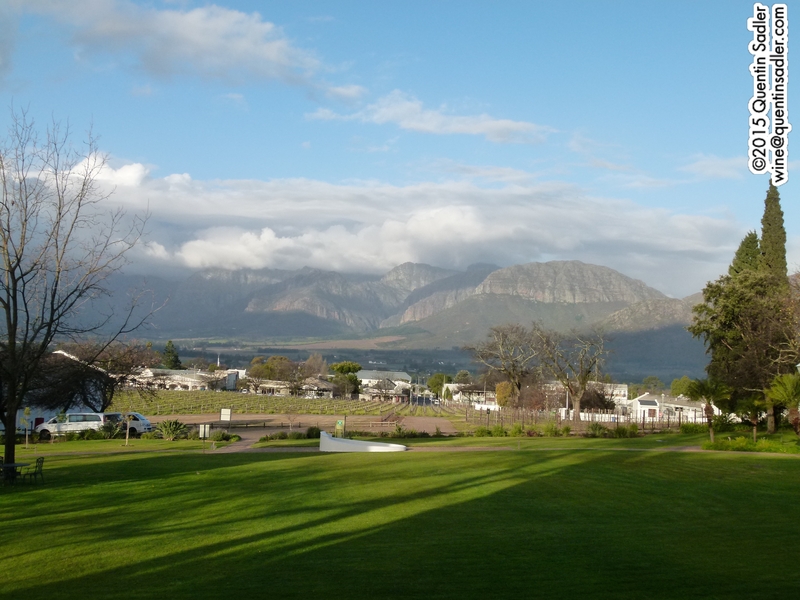 This enthralling tour of the winery and cellars was followed by a comprehensive tasting of their wines. It was an impressive lineup of mostly Merlots, including 2 whites and 1 rosé. 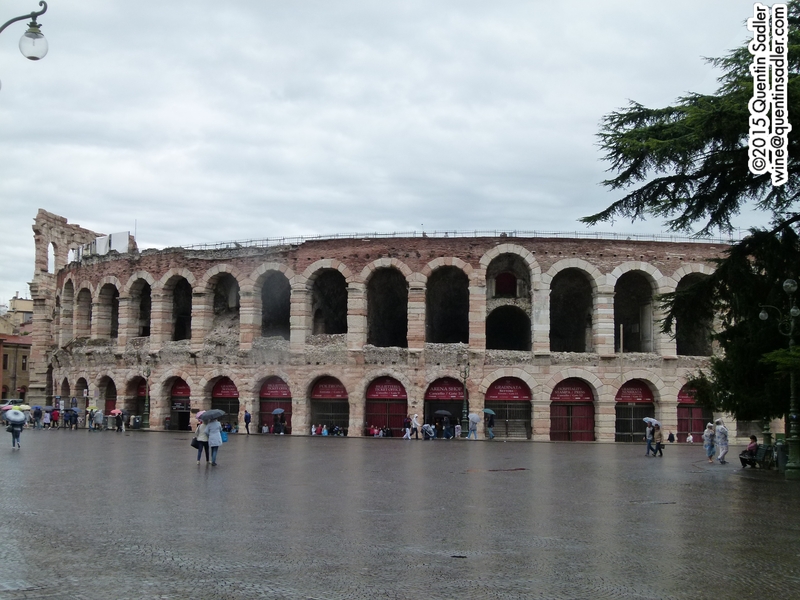 The quality was high and I particularly rated the 2013 Contrada Bianco di Merlot which is unoaked and because there is no Malolactic Fermentation has just enough acidity to be fresh and lively. Of the reds my favourites were the supple 2011 Sassi Grossi Merlot from Gialdi and the silky 2011 Riflessi d’Epoca Merlot from Brivio with its cedary oak and fine grain tannins. 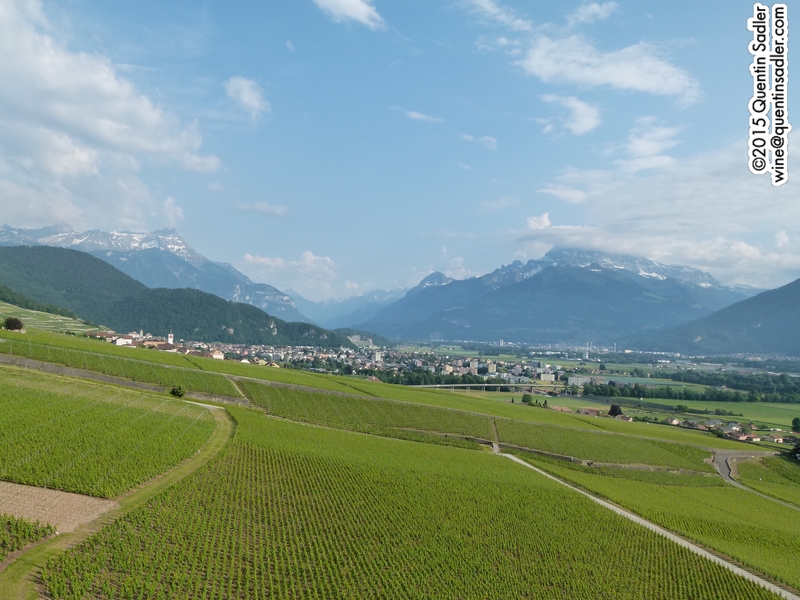 Guido Brivio are also involved in the Swiss Premium Wine project in which four producers – counting Gialdi and Brivio separately – blend a cuvée called Quatromano, another 100% Merlot, which consists of 25% from each of the different winemakers. The other two contributors are Tamborini and Delea, both of whom I visited the following day. All in all it was fascinating introduction to Ticino that was then made all the better by Guido taking our group to a local restaurant for dinner. 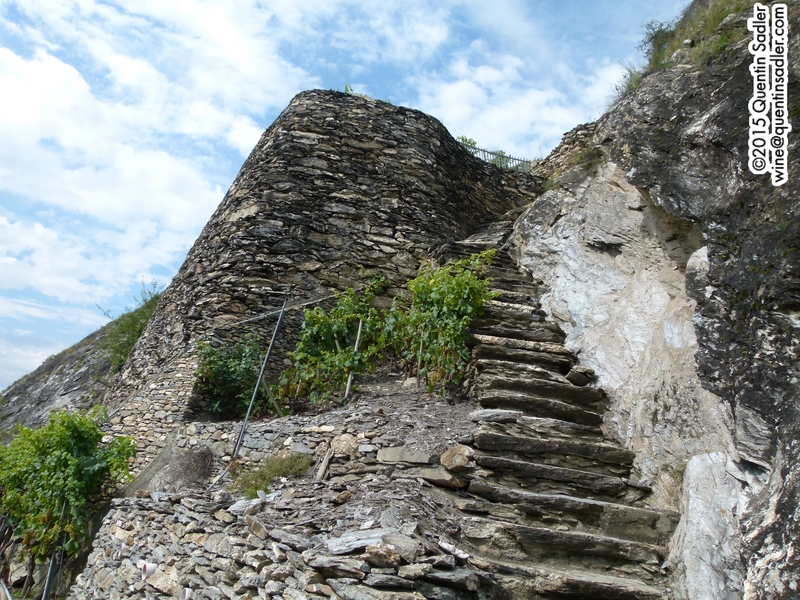 The place is called Grotto Bundi and, like the cellars, is built into the mountainside. However over 80 years the place has evolved into a complex series of rooms on several floors and an attractive outside area, on what is now a pedestrianised road, with wonderful views of the surrounding countryside. 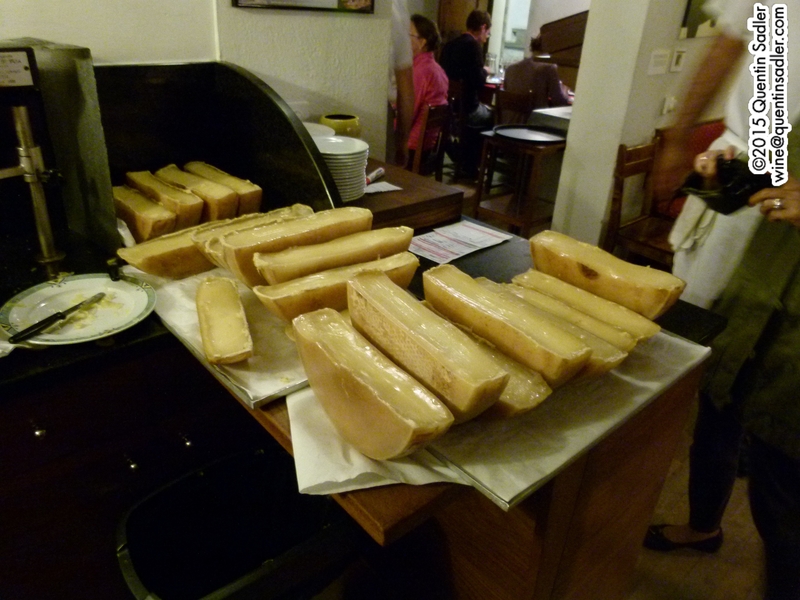 Guido had planned a traditional feast of polenta accompanied by lots of different casserole dishes, beef, pork, lamb, sausage – which was most people’s favourite – mushrooms, the list goes on. It was all delicious and washed down with copious amounts of Gialdi Brivio wine it was an evocative and joyful taste of Ticino culture. Ueli Kopp and Barbara von der Crone. 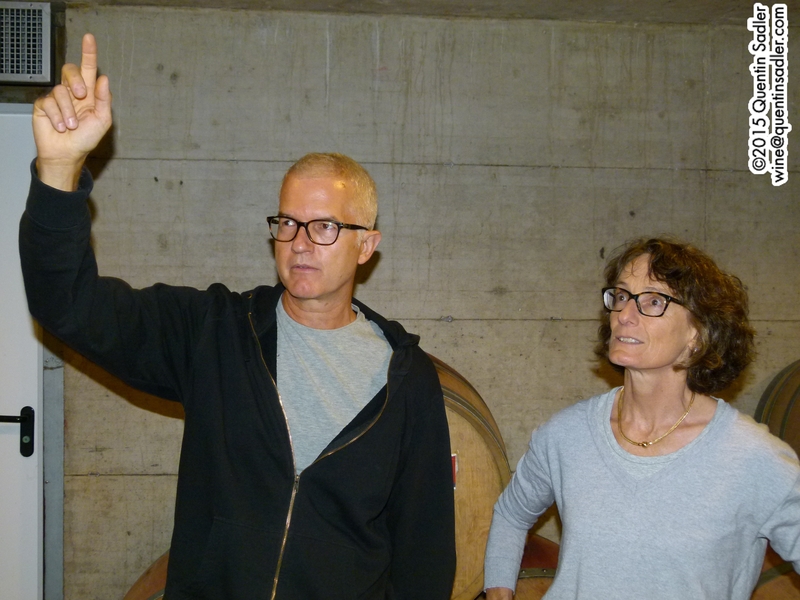 Other visits were to the boutique estate of Cantina Kopp Von der Crone Visini. It’s run by the delightful Ueli Kopp and Barbara von der Crone whose passion and commitment shows in everything they do. Their red wines are superb, especially the Balin blend of Merlot, Cabernet Sauvignon and Arinarnoa (a crossing between Merlot and Petit Verdot). 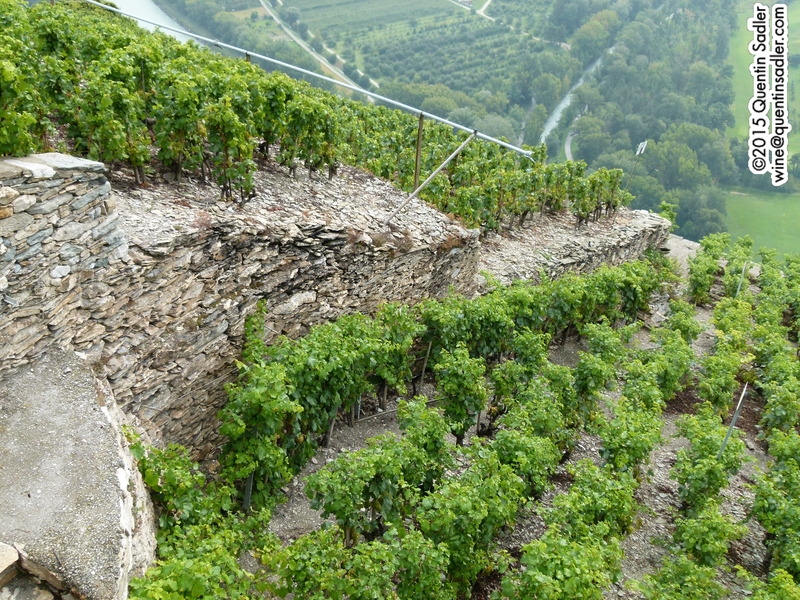 Some of the vineyards at Azienda Mondò. 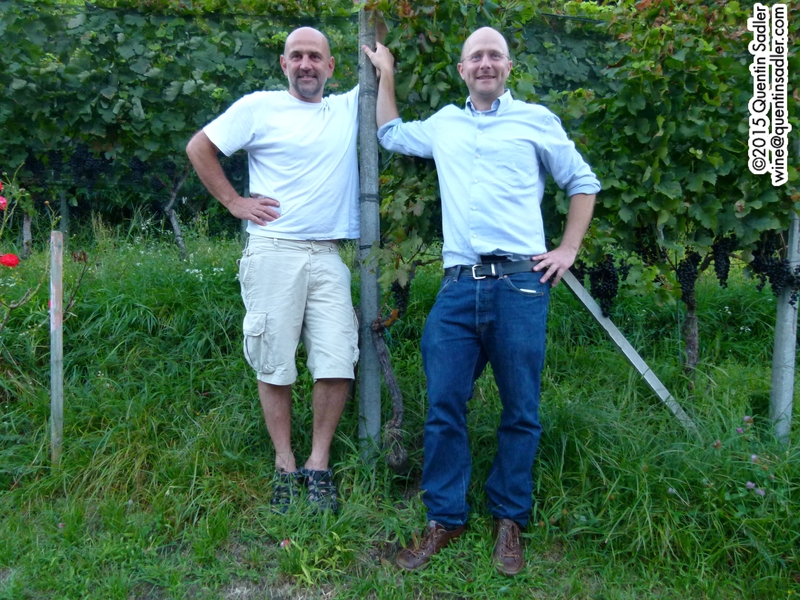 Antonio Girardi and Giorgio Rossi of Azienda Mondò. 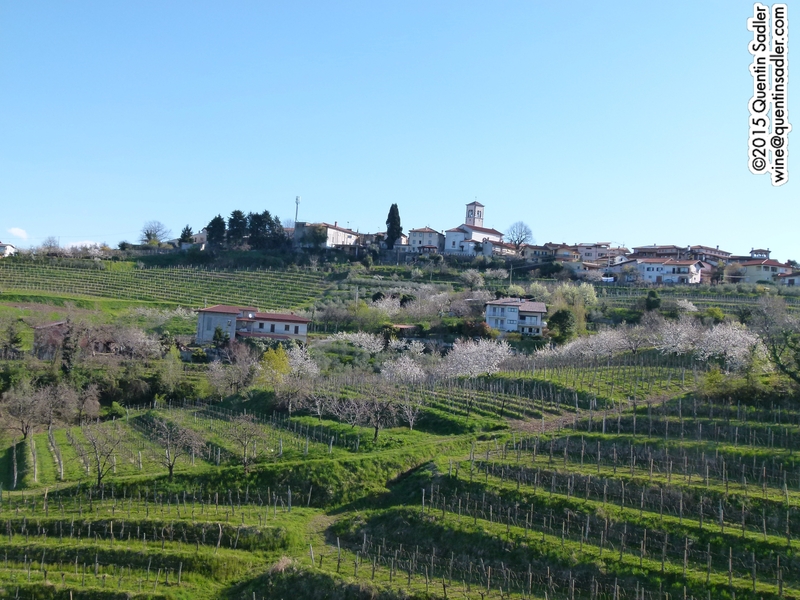 Azienda Mondò is another boutique winery that farms 6 hectares speed over 30 parcels of hillside to produce some superb wines. I was particularly taken with their Bondola, which is a local grape which is only just clinging on to life as it is thin skinned and can rot quite easily. 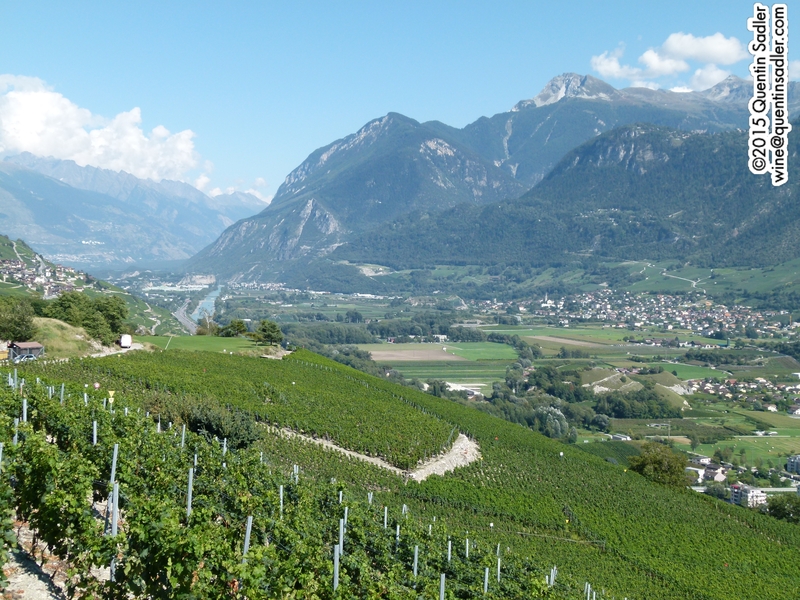 There are only 11 hectares – all in northern Ticino – and almost exclusively grown by the small producers, so almost none is seen on the market. Mondò have about 10% of it and their Rosato di Bondola del Nonu Mario is superb with the local salami. 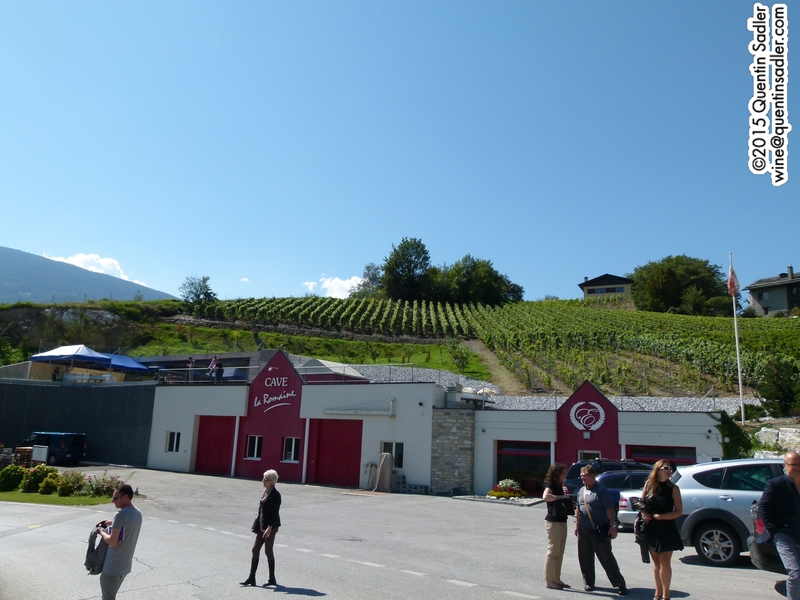 By contrast, Cantina Tamborini is the local giant producer that owns 23 hectares, but they also buy a large amount of grapes from contract growers. 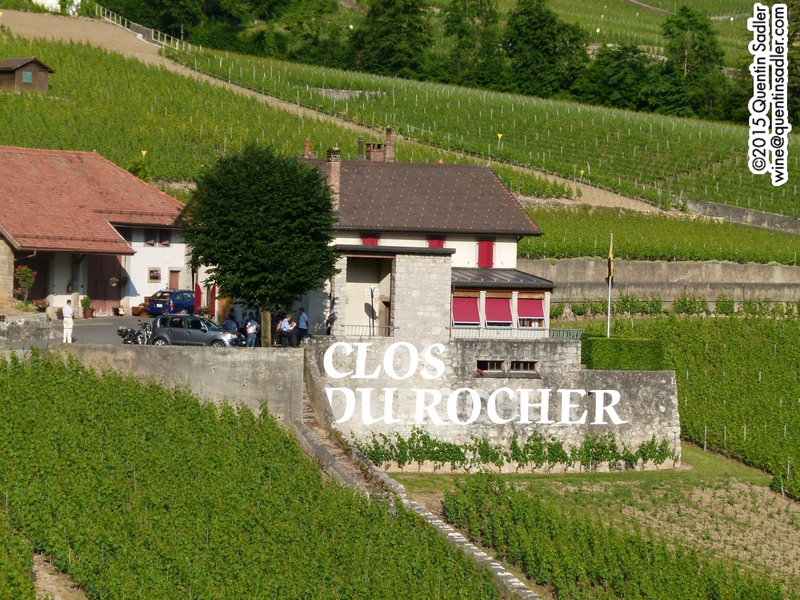 In effect they operate as an estate and a negotiant and craft some very good wines. 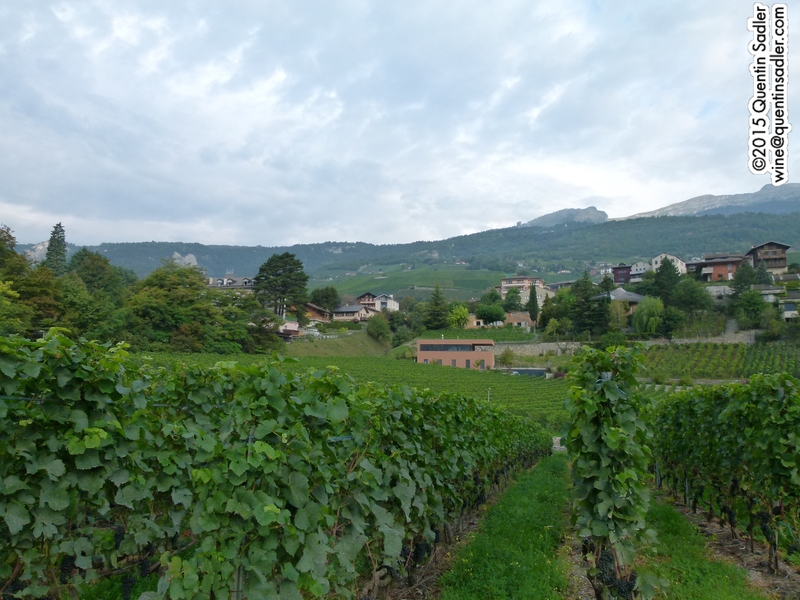 Their single vineyard San Zeno Costamagna Merlot Riserva is particularly impressive and I have shown it in tastings since – it tastes a bit spicy, rather like a good Carmenère. 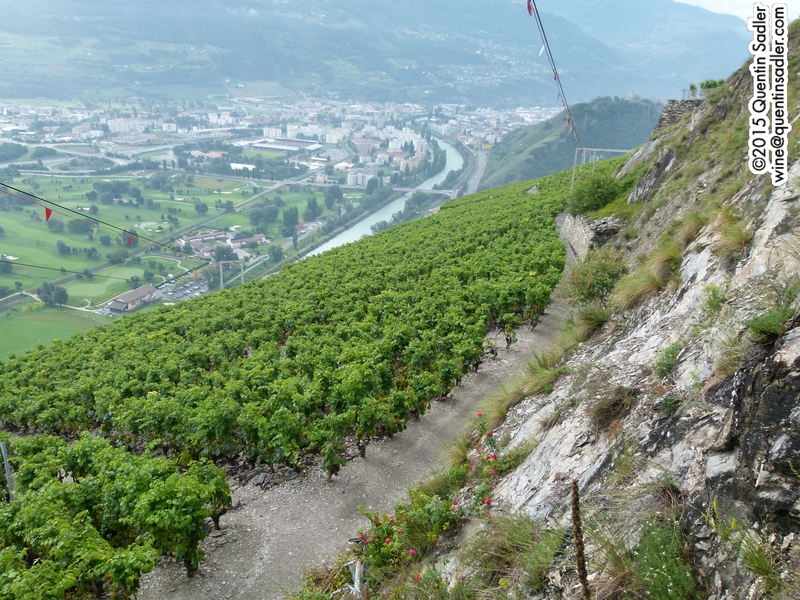 Ticino vineyards, these south facing vines are the most southerly in Switzerland, Italy is a short walk away. 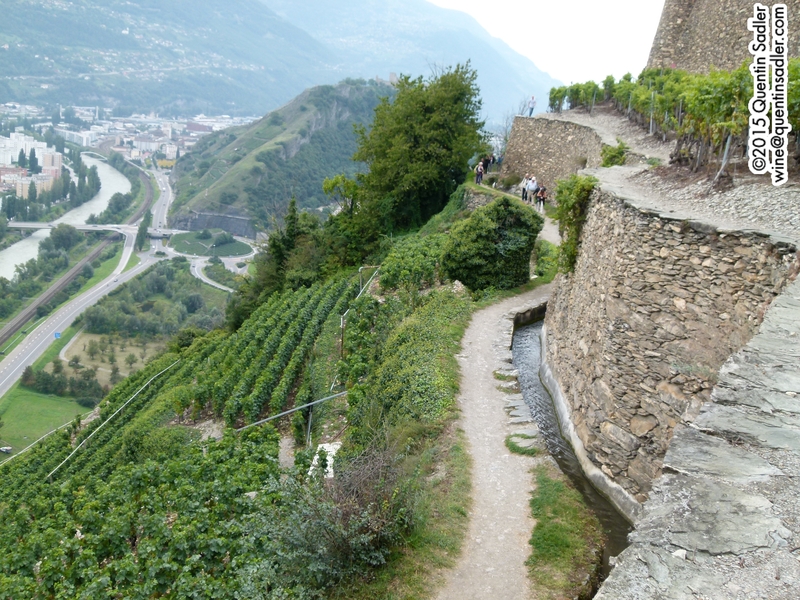 These vineyards belong to Tenuta Montalbano, a co-op that is the biggest wine producer in Ticino. 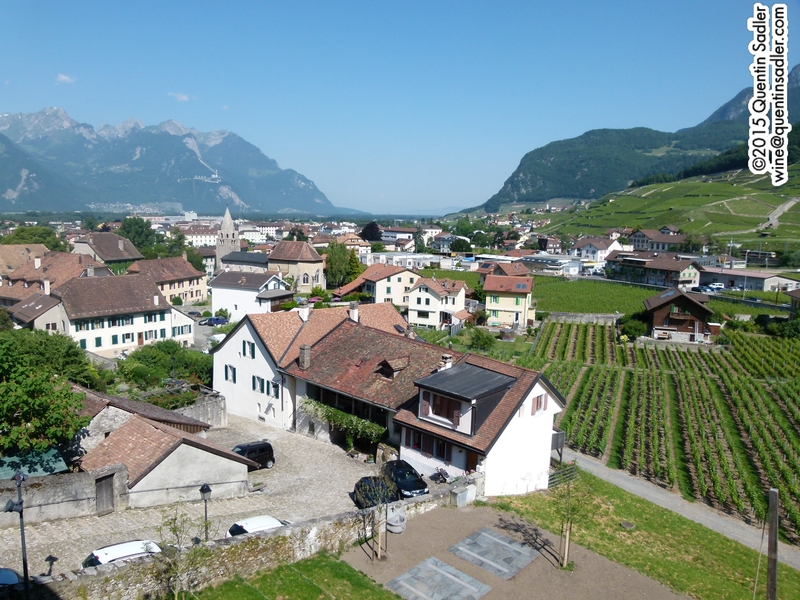 It has 380 associated members and also owns this 22 hectare estate which is the largest single block of vines in Switzerland. Another view of Tenuta Montalbano. 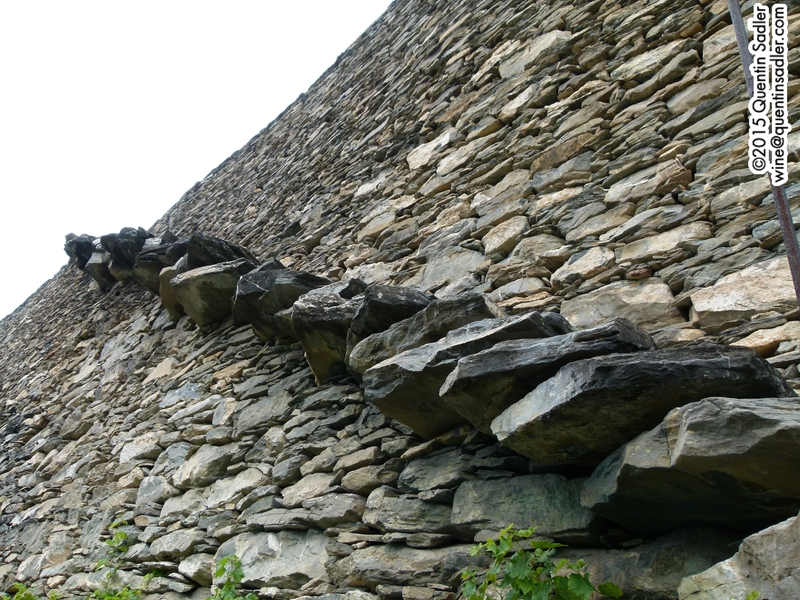 All in all I found Ticino fascinating. 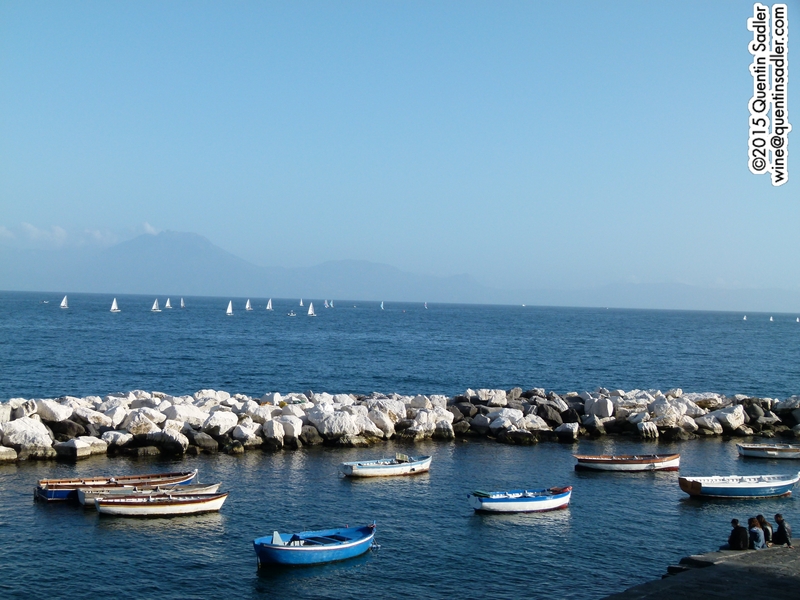 It is a very beautiful place full of wonderful scenery and great Italian food – as long as you like polenta. 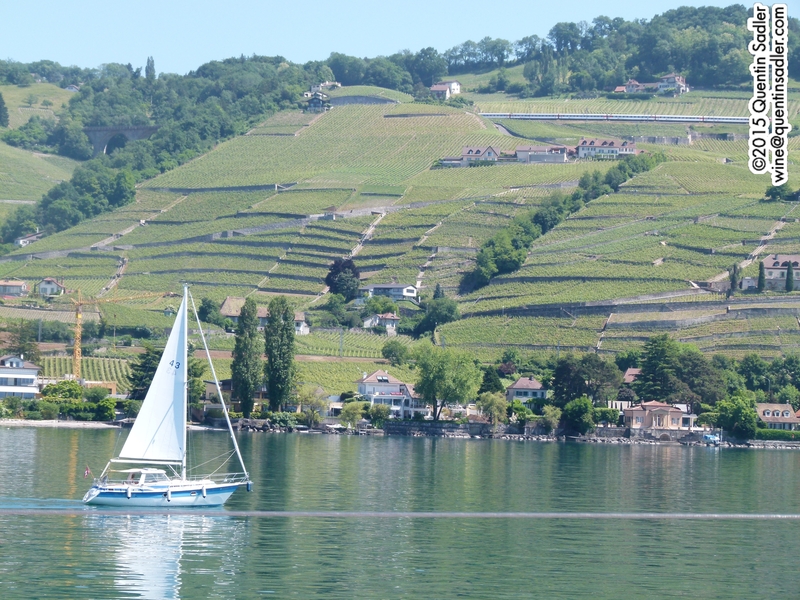 The people are charming and the wines are very good and well worth trying, especially as they make so many different styles from, in the main, a single grape variety. 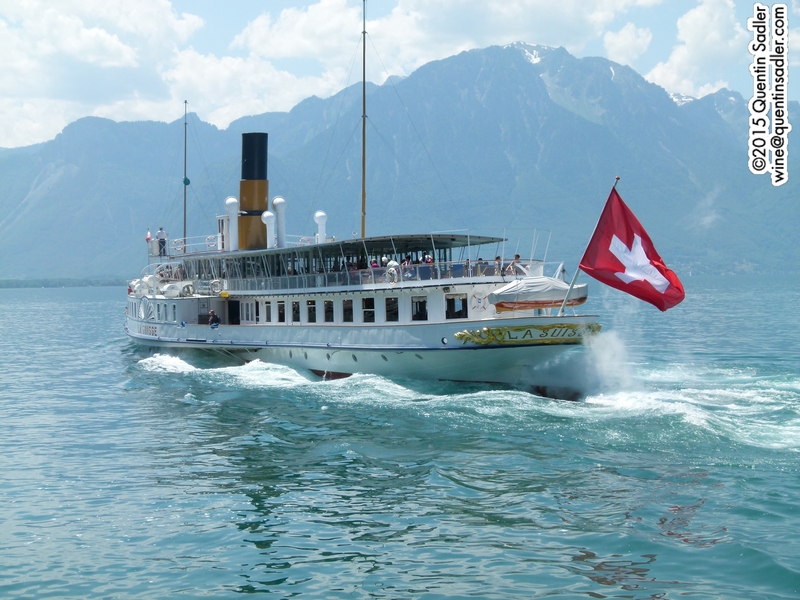 They are quite hard to get outside of Switzerland, but grab some of you can. 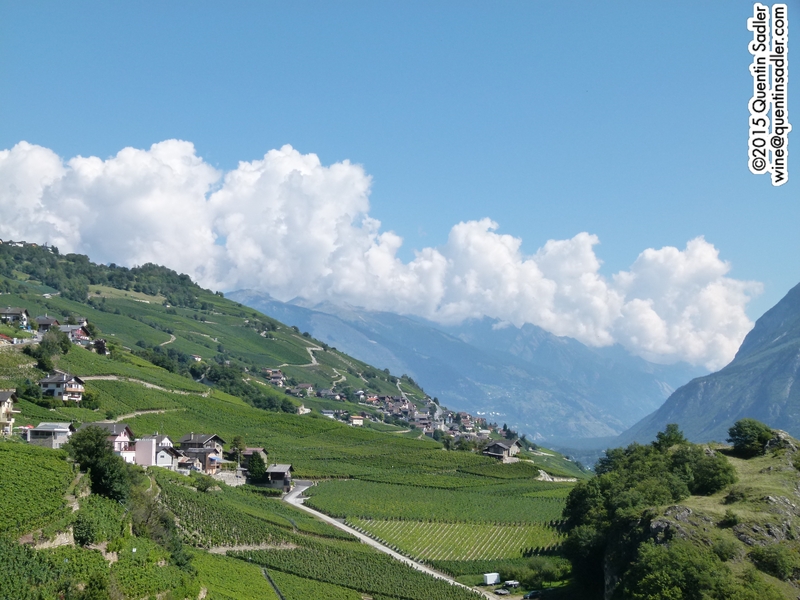 Alpine Wines sell some wines from Ticino in the UK and as usual the US is well served by wine shippers bringing in more unusual wines including Swiss ones.